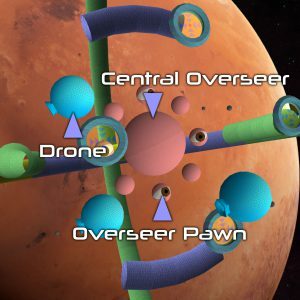 The Mars Overseer is the master control center for invading troops; they cannot function without it. If we can destroy the Overseer, all rebels will be rendered useless and the Martian War will come to an end. The four initial blue drones that follow you around belong to the four open Overseer Pawns. When a drone is destroyed, the Pawn releases another drone. To prevent regeneration, destroy the open Pawn (a pawn can only be destroyed when open). Once both a Pawn and its drone are destroyed, a new Pawn will open up. Repeat these for each Pawn, until all are destroyed, at which point the central Overseer will open up and become vulnerable.